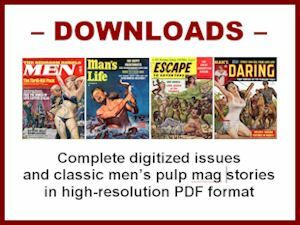 Three of the top illustration artists whose work appeared in many men’s adventure magazines have died in recent months. 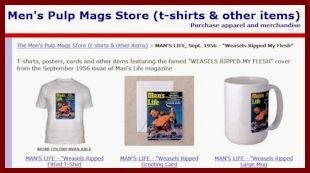 One was Wilbur “Wil” Hulsey, the man who created the iconic cover painting for the “Weasels Ripped My Flesh” story that inspired this blog, the title of our first anthology of vintage men’s adventure magazines and, of course, the Frank Zappa album title. Hulsey was a master of everything from animal attack covers to “Good Girl Art” covers. He died in February at age 89. Rudy Nappi, who started as a pulp magazine artist, then did hundreds of paperback covers and men’s adventure mag illustrations, died in March at age 92. In June, artist Earl Norem also passed away at the age of 92. Earl was one of the most beloved illustration artists in two realms: men’s adventure magazines and comic books. He did hundreds of MAM cover paintings and interiors. 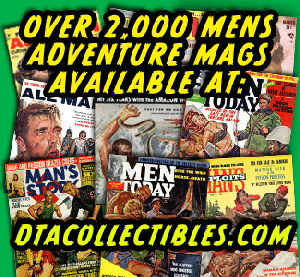 A large percentage were for the classic Magazine Management Atlas/Diamond magazines: ACTION FOR MEN, COMPLETE MAN, FOR MEN ONLY, MALE, MAN’S WORLD and STAG. 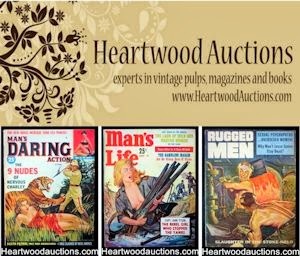 Most of the rest appeared in the long-running men’s adventure mags published by Stanley and Crestwood, MAN’S LIFE and TRUE MEN STORIES. Earl Norem was equally prolific in the world of comics. He created hundreds of awe-inspiring, often MAM-like cover paintings for many Marvel comics, such as SAVAGE SWORD OF CONAN, MASTERS OF THE UNIVERSE, TALES OF THE ZOMBIE, TRANSFORMERS and PLANET OF THE APES. He is also known for doing some great, gonzo artwork for the MARS ATTACKS comics and trading cards. In fact, in the weeks before his death, Earl was working on a new MARS ATTACKS trading card project for Topps. Naturally, Rich also owns many of Earl Norem’s men’s adventure cover and interior paintings, as well as some of Earl’s comics cover art, like the painting used for TALES OF THE ZOMBIE #6 (July 1974). 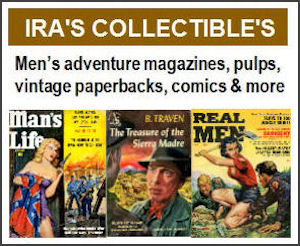 Rich and several other avid collectors of Norem’s artwork are members of the Men’s Adventure Magazines Facebook Group that’s an offshoot of this blog. One of them is Craig Clements. Craig has been buying paintings and sketches directly from Earl Norem for years. The Norem artwork he owns runs the gamut from men’s adventure illustrations to Mars Attacks paintings to comics cover paintings and preliminary sketches. His collection also includes rarely-seen Norem treasures like Christmas cards from Earl and his wife Peg (illustrated by Earl, of course). Another notable collector of Norem’s work who recently joined our Facebook group is Ray Falcoa. Ray was a friend of Earl’s who owns an amazingly large collection of the artist’s preliminary sketches and original paintings. Among other things, Ray owns the black-and-white and color prelim sketches Norem did for one of my favorite MAM covers: the portrait of a tough-looking biker with mirror sunglasses on the cover of MEN, April 1969. Earl apparently thought the biker would be facing right when he did the sketches. But either he or the Art Director ultimately decided to flip it the other way for use on the magazine cover. Ray has also been the owner of another one of my Norem faves: the painting used for the story “We Heisted New York’s ‘Diamond Row’” by W.J. Saber in STAG, August 1973. It’s a gonzo masterpiece that features a gang of thieves wearing cartoon character masks, shooting it out with the cops. Ray is a collector of both men’s adventure and comics artwork. So he also owns many examples of Norem’s comics artwork. In addition to posting some examples in our MAM Facebook group, he has posted many of his Norems on his pages on the ComicArtFans.com site. I have yet to be able to identify which men’s adventure magazine issues some of the Norem paintings David owns were used in. For example, does anyone out there know what the wild painting with the collection of skulls wearing military hats was used for? Or the one with the pistol-packing babe under the sun lamp? If you know, please shoot me an email or drop by the MAM Facebook group and lets us know. In upcoming posts, I’ll showcase more Earl Norem illustrations. Like most everyone who knows his work, I love it. R.I.P., Earl. I imagine you being borne to heaven by a bevy of babes like those you painted.